Virgin Galactic's VSS Unity soars on its first-ever glide flight on Dec. 3, 2016. WASHINGTON — Virgin Galactic's second SpaceShipTwo performed its first free flight Dec. 3, a glide test that begins the next phase in testing of the commercial suborbital spaceplane. SpaceShipTwo, named VSS Unity, and its carrier aircraft, WhiteKnightTwo, took off from the Mojave Air and Space Port in California at about 9:50 a.m. EST (1450 GMT). The spaceplane separated from WhiteKnightTwo at 10:40 a.m. EST (1540 GMT), gliding back to a runway landing in Mojave 10 minutes later, according to updates provided by the company. Virgin Galactic's second SpaceShipTwo spacecraft, the VSS Unity, and its WhiteKnightTwo carrier aircraft roll out to a runway at the Mojave Air and Space Port in California on Saturday, Dec. 3, 2016 for Unity's first-ever solo glide test flight. Virgin Galactic had planned to carry out the glide flight Nov. 1, but high winds led flight controllers to keep SpaceShipTwo attached to WhiteKnightTwo, turning the mission into the second "captive carry" test flight of the vehicle, after one in September. A second attempt, Nov. 3, was aborted because of an unspecified technical issue discovered prior to the planned release. The vehicles took to the air again Nov. 30 on another captive carry flight. "As part of our ground & flight testing, we made a few tweaks to the vehicle," Virgin Galactic said in a tweet, which were tested on that flight. The company did not disclose the nature of the changes. The flight is the first in a series of glide flights to test the aerodynamic performance of the vehicle before moving ahead into powered flights. In an interview at the International Symposium for Personal and Commercial Spaceflight in Las Cruces, New Mexico, Oct. 13, Virgin Galactic President Mike Moses said the number of flights will depend on how long it takes to achieve a set of test objectives. "There's 10 glide flights' worth of targets," he said. "We could do those in 8 flights, or might take 15, but we're not going into the next phase before we clear those." Once completed, SpaceShipTwo will begin a set of powered test flights. 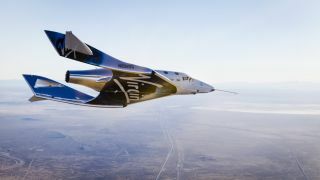 The first SpaceShipTwo, named VSS Enterprise, was performing its fourth powered test flight when it crashed in October 2014, killing co-pilot Michael Alsbury and injuring pilot Peter Siebold. An investigation by the National Transportation Safety Board concluded that the vehicle broke up when Alsbury prematurely unlocked the vehicle's feathering mechanism, causing the tail section to rise up as the vehicle accelerated through Mach 1. The investigation criticized vehicle developer Scaled Composites for not taking steps to prevent such a premature unlocking and for creating a heavy workload for pilots of the vehicle. The stand-down after the accident gave Virgin Galactic time to work on the vehicle's hybrid rocket motor, whose development had been troubled. "If the spaceship was ready, we could do a powered flight tomorrow," Moses said in October.